The exhibition presents works of various media by native Russian artists Nikolai Oskolkov and Olessia Maximenko. 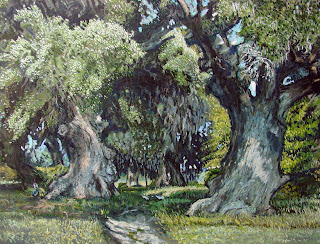 Included are oils on canvas, ink and pencil drawings, tempera, and mosaic. This show is the second of a series of planned annual shows by the named artists to be held every spring in Gallery 80808. 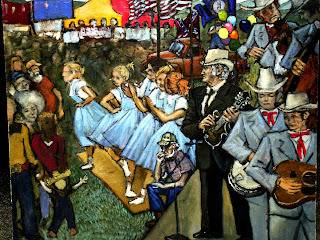 The opening reception will feature the High Lonesome Bluegrass Band, a Russian folk balalaika and piano performance by Nikolai Oskolkov, and fantastic catering by Albert Persons. 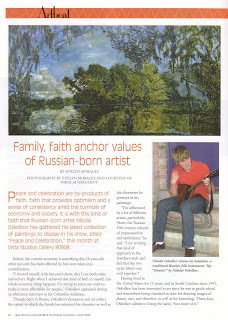 For additional information, please call (803) 361-8500 or email [email protected] More artwork by Nikolai Oskolkov and Olessia Maximenio can be found at www.nkoart.com. Throughout our lives, we are all touched one way or another by events that make us seriously consider our faith personally and socially, especially in light of the tumultuous events of the past year. In spite of constant learning, we cannot always easily cope with the complexities of our world. Our lives change in ways we do not expect or accept baring our strengths and weaknesses. Even human will fails before wonders and tragedies that are beyond our control that make many of us realize that the world does not ever really run on our terms. Since life is such a discovery, we all go through the trial of humility and forgiveness in order to find acceptance. Faith has often been represented in symbols, which carry original and often controversial meanings that can ironically change in the course of time with various interpretations. We may also invent representative signs and activities which may define exclusively one person or a group as a symbol and make it possible to call out to our peers for understanding and support. We often look for consolation in symbol, art, and music which help us make positive decisions in life in order to benefit our communities and ourselves in return. Now, as ever, we all need the power of faith. One great reason for faith is given when we realize how we can weave a complex and magical web of human connections with whom we may have similar yet contrasting goals. Many of us are lone wolves from scattered packs who doubt that there is a true home at all and are forced to accept new dens for our traveling spirits with care and love. It is amazing when people like Olessia and Nikolai meet by chance and circumstance from literally opposite sides of the globe like two drops from the same boiling pot. They exploit their cultural similarities and further learn from one another to have a stronger, happier life and work together to manifest their dreams. As artists, we work to accept all people of society as rightful inhabitants of our tragic and beautiful planet. We need to believe and remember how protected we are here in our isolated and unified American land and remember how many reasons we have to be grateful, even though it was exactly in South Carolina where even that oneness has proven its fragility. Let us recognize human life as a privilege in spite of uncontrollable circumstances that can even drive us to total despair. Peace and celebration is a fortunate part of our existence that shows that we are willing, at least for a moment, to appreciate a true heaven on earth. 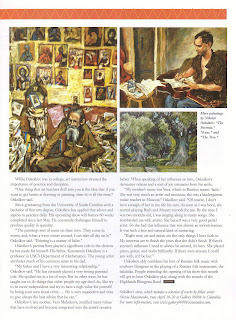 Nikolai Oskolkov was featured in the Lake Murray Magazine article below. It was written by Evelyn Morales with images by Evelyn Morales appearing by courtesy of Nikolai Oskolkov. Click on the images to enlarge for reading pleasure! Poetry and Art join hands at an event that showcases the diversity of the artist’spalette, whether the artist is a studio artist or a poet. South Carolina Poetry Initiative will be hosting its 2009 Single Poem Contest and Book Contest Awards Ceremony Saturday, April 11 at 80808 Vista Gallery. View the featured art exhibit, hear the work of nationally renowned poets, and catch the wave of excitement as this year’s winners of the SC Poetry Initiative’s Single Poem and Book Contest are announced. The event will take place amidst the stellar art of Nikolai Oskolkov and Olessia Maximenko, and will feature food, music, poetry, and a phenomenal multimedia art exhibit. Each artistic endeavor will address in its own way how the human spirit strives to survive, celebrate, and challenge the world in which it exists. 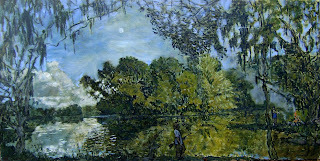 < http://www.cas.sc.edu/engl/poetry> or simply Google: South Carolina Poetry Initiative. Event will also be showcased on the University of South Carolina’s Arts Institute website: .